Original, I know. A bit like this movie’s premise. 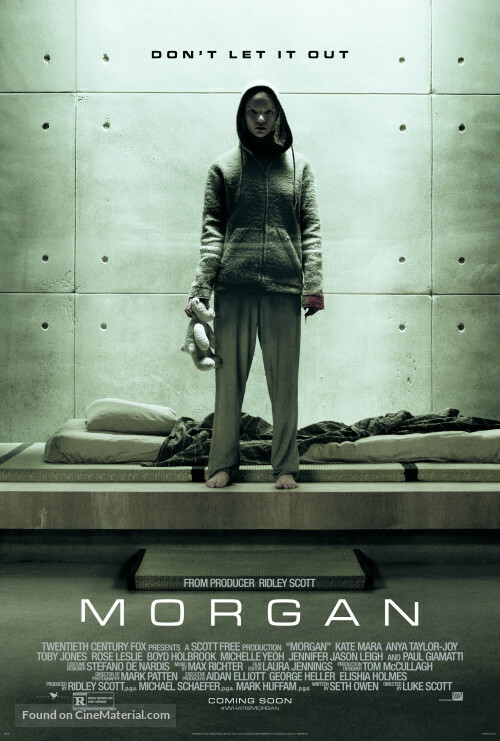 A corporate risk-management consultant (Kate Mara) must decide whether or not to terminate an artificially created humanoid being (Anya Taylor-Joy). If Ridley Scott’s son wasn’t directing this, I wouldn’t have been surprised to see this feature as a Late Night Premiere on the SyFy Channel. Despite an eye grabbing opener with Morgan lashing out at her carer (Jennifer Jason Leigh – The Hateful Eight), the film was put on the back burner with a meandering pace and mindless exposition. Kate Mara (House of Cards) will probably be the only one to come out of this unscathed. She might have featured in some duds (*Cough* Fantastic Four *Cough*) BUT I was impressed with her performance as Lee Weathers. The extreme pixie haircut, cold demeanour and abrupt manner made her the most interesting character out of the bunch. I was more intrigued with her agenda than meeting the sulky Morgan. I was surprised at the star studded supporting cast involved; Brian Cox, Narcos’ Boyd Holbrook, Toby Jones and Michelle Yeoh. A shame that none of them really made an impression. Rose Leslie (Game of Thrones) wasn’t too bad as the eccentric behaviour therapist and delivered a decent American accent. The only problem was that she wasn’t in it enough. “Morgan’s not a she. She’s an it”. I was happy to allow the pace to trundle along if the film went somewhere BUT for an hour, we had existential waffle, followed by more existential waffle and then . . . You get the idea. The whole thing was a poor man’s Ex Machina. I’d seen it all before and done better. We had the same debates about defining humanity, action and consequence, cause and effect. Yawn. I was NOT a fan of The Witch BUT thought Anya Taylor-Joy delivered a good turn. The same can be said with this. She did the best she could with the character BUT I was just wasn’t emotionally invested like I was with Alicia Vikander. The corporate angle had potential as the scientists exchanged heated debates over artificial intelligence and profit BUT it never really took off. What happened in Helsinki? All we had were endless references to an incident that was never expanded on or explored. This was the only loose thread I wanted to know about? Was there a failure? Did they go Westworld on them? What?! The pace dragged and all the science-y stuff about Morgan didn’t do anything to help. Within a month, she was a walking and talking biologically advanced toddler. Within a year, she could control and alter her environment (Why couldn’t we see any of that?). By the age of five, she was . . . a sulky pale looking teenager in a hoodie. Riiiiggghhhttt. The creepy Silence of the Lambs vibe was engaging enough as Weathers and Morgan had their intense stare-off and the game of cat and mouse began. The questions piling up. Is Morgan sentient? Is she aware of her abilities? If she can do all these things then why the hell is she sitting in a cell? Taylor-Joy delivered a masterstroke with the expressions. She looked scary and sincere in the same instance and things (finally) picked up when Paul Giamatti’s Dr Shapiro arrived to perform a psych evaluation. There was genuine suspense and tension as Shapiro bated Morgan. Questioning her motives and emotions. Goading her to react. A ticking time bomb. I could have watched a whole movie of just that. The last 20 minutes seemed to realise it was clasping at straws and cranked the pace up to 11 with a frantic, violent and rushed finale. The only problem was that with this sort of story line, there was only ever going to be two outcomes which made the end result pure predictable hokum. Once you took away the tension and philosophical sparring, you had something very much like the protagonist; a cold pretty looking effort. Mark Patten’s cinematography certainly made the idyllic setting surrounding The Facility like a country paradise BUT if Ex Machina hadn’t beaten Scott and co to the punch, this may have fared better. BUT only ever so slightly. Despite a talented cast and a mad dash finale, this was tragically flat and disappointing. Watchable guff BUT nothing to shout home about.